If one is to strictly go by the Punjab State Electricity Regulatory Commission’s (PSERC) power tariff order today, the Punjab State Electricity Board (PSEB) may not be able to purchase any electricity as a short-term measure for the remaining nine months of the current financial year. Despite tall claims of the government that chicken pox has been eradicated in the state, the death of a boy due to the disease has created panic among local residents today. According to sources, Karamjit Singh (13), who was studying in Mussoorie, had come to his parents here. During his stay in the city, he contracted chicken pox. He was admitted to a private hospital where his condition deteriorated. Several literary and academic organisations of NRIs living in the US and Canada have urged Governor Gen S.F. Rodrigues (retd) to stand against the unwarranted political interference in the affairs of Guru Nanak Dev ( GND) University by the Punjab government. Even as BJP MP Navjot Singh Sidhu has promised to install a statue of late Field Marshal Sam Manekshaw here, president of the SAD (A) Simranjit Singh Mann has said his party would oppose the move. Differences surfaced between the SAD and the BJP during the recently held elections to the local Municipal Council have now come to the fore with BJP candidates levelling allegations against the SAD rank and file. They said SAD leaders had worked against them in the elections. Former Chief Minister Amarinder Singh has said only Congress president Sonia Gandhi will decide on his strained relations with PPCC chief Rajinder Kaur Bhattal. The SAD (Amritsar) has demanded the removal of SGPC chief Avtar Singh and jathedar of Akal Takht Giani Joginder Singh Vedanti for not observing the foundation day of the Takht. Punjab irrigation minister Janmeja Singh Sekhon today handed over appointment letters to 83 persons, who are dependents of employees who had died in harness. They have been given jobs on compassionate grounds. 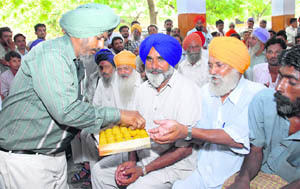 Inderjit Singh Jaijee, convenor of the Movement Against State Repression (MASR), has said patwaris in Sangrur district have collected information with regard to the cases of suicide by farmers. After targeting the synthetic milk and ‘khoya’ mafia in the state, the Punjab Health Department authorities have now started inspecting other eatables. The department has destroyed and dumped fungus-ridden 400 quintals of pickle that the department claimed was prepared and stored under unhygienic conditions by a Samana (Patiala district)-based company. Punjab Chief electoral officer Vijay Kain yesterday said photo electoral rolls for all Vidhan Sabha constituencies, as per the newly delimited Assembly constituencies, were being revised. Bharat Inder Singh Chahal, the media adviser to Punjab’s former Chief Minister Amarinder Singh, today got interim relief from the high court. Tikshan Sud, medical education and research minister, has warned that all private medical, ayurvedic, homoeopathic, nursing and paramedical colleges, that are operating from a place for which they had not been given approval, will be de-recognised.